How to spot market peaks using Advance/Decline ratio (ADR)? ADR is a market breath indicator showing the number of stocks closing higher vs the number of stocks closing lower over certain period of time.The interpretation of this ratio is quite simple - the higher it is, the more advancing stocks there are, the more overvalued the market is. 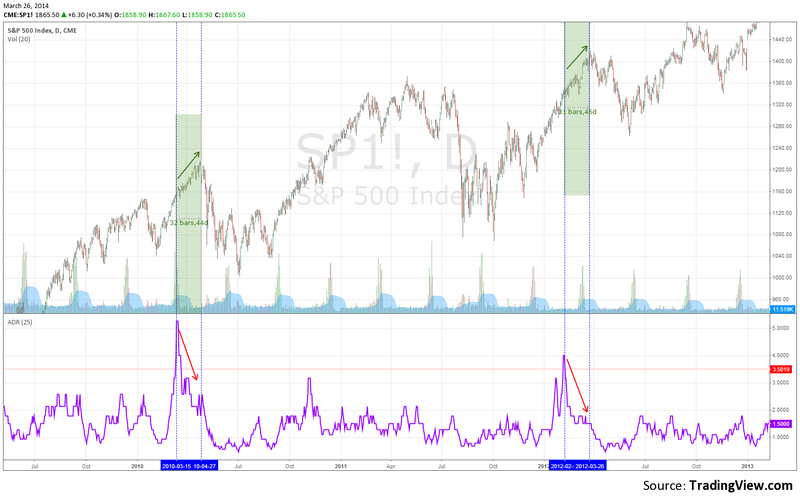 However the timing here is important as its peaks not always coincide with the market ones. In some cases higher ADR actually supports the market, especially if it is after severe correction. That sound logical. After sharp drop there is large number of shares bouncing. First, look for divergence between the market and the indicator. Rising market index accompanied with declining number of advancing stocks means upcoming drop. Second, look for high readings of the ADR. Values above 3.5-4x to be considered as significant. (Note: analysis is based on 25 period ADR). It is most likely to see ADR higher than 3 during first quarter of the year. Usually that is February or March as it happened in 2010, 2012 and as it seems in the current 2014. After the peak in ADR with values > 3.5 the bull market continues 40-70 more days before correction occurs (see 2010, 2012). The case of 2007. 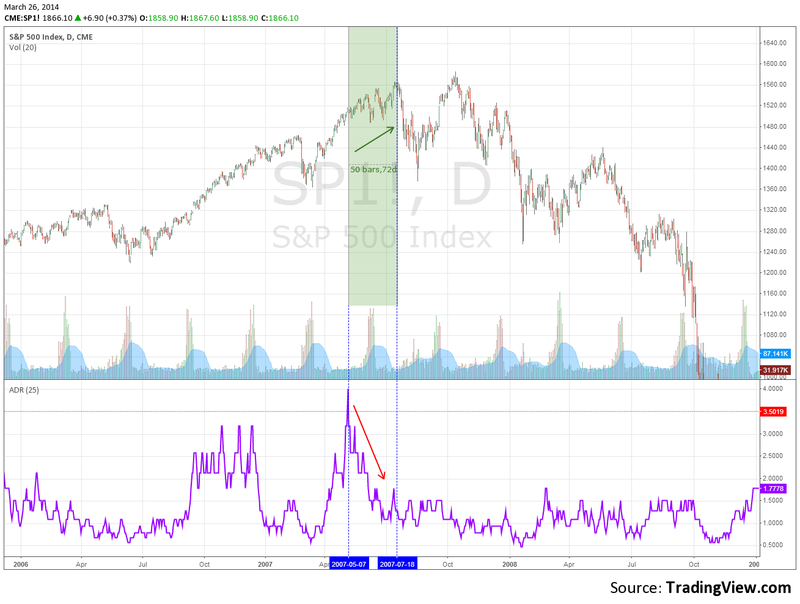 It is interesting how the indicator behaved just before the previous bull market peak. In 2007 ADR reading above 3.5 was registered in May. Since then the index started falling while overall market continued climbing, although on sideways. Still the market trend was positive for some 72 days after the ADR max. After that followed sharp decline erasing the year gains. Back to present as of 12th of March ADR was 3.16x i.e. the advancers were 3.16 times more than decliners. That does not seem supportive for the market trend because ADR is not extreme (above 3.5) but within the range 2.5-3.5. In that case the market mildly pulls back with the ADR line as it happened in 11 Oct 2011 and 23 May 2013. For the moment according to ADR analysis there is no reason to believe that major correction is on the way. However if we see steady decline of the ADR index with still rising market that is clear signal that strong correction could evolve in the next 40-70 days. Fibonacci numbers application in the financial markets provide interesting results. Here in this post I am going to share with you extremely interesting method for timing the markets. It is based on the Fibonacci numbers applied for the time scale unlike its traditional use for the value scale of an asset chart. I am not going to deepen into details about the theory behind the Fibbo sequence but rather its application on S&P500 index bear market timing over period of 27 years. You could get the logic of Fibbo ratio and its use in the posts: Application of Fibonacci Numbers and Stock Market Cycle And Market Peak Projecting (1982-2014). 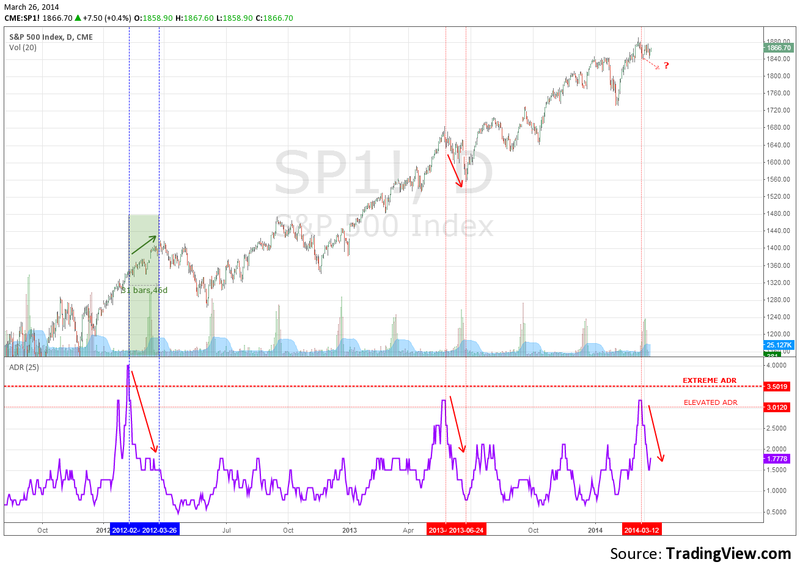 This method back test showed that timing the beginning of a new bear market could be done with few months accuracy. That considering the time span of 27 years is notable. The logic behind this method is quite simple. Projecting the bear market duration gives certain Fibbo sequence number (1,2,3,5,8,13,21) which correspond with a date. Keeping in mind that average bull market lasts around 5 years the Fibbo number after the fifth year of the bull market is supposed to be the inflection date as then is most likely a bear market to begin. Thus the period around that projected date is most likely to be the market direction turning point. Looking the charts proves that. The bear market started Aug 1987 continued until Dec 1987. Projecting that period, the Fibbo number after the fifth year of the following bull market (started Dec 1987) was 21 which coincided with Aug 1993 on the time scale. The actual bull market termination was Jan 1994. Based on the bear market duration of 5 months the Fibbo time zone indicator showed that bull market should end Aug 1993. The accuracy here was 6 months. (see the chart). The bear market started Jan 1994 lasted until Dec 1994. That month was the beginning of a new bull market. The bear market Fibbo projected number after the fifth year (1999) of that bull market appeared to be Sept 2000. Actually the market consolidated since March 2000 and the real drop started in Sept 2000. Here the accuracy was 6 months as well. Next bear market, started March 2000, was one of the longest among recent market cycles. It lasted until Oct 2002. 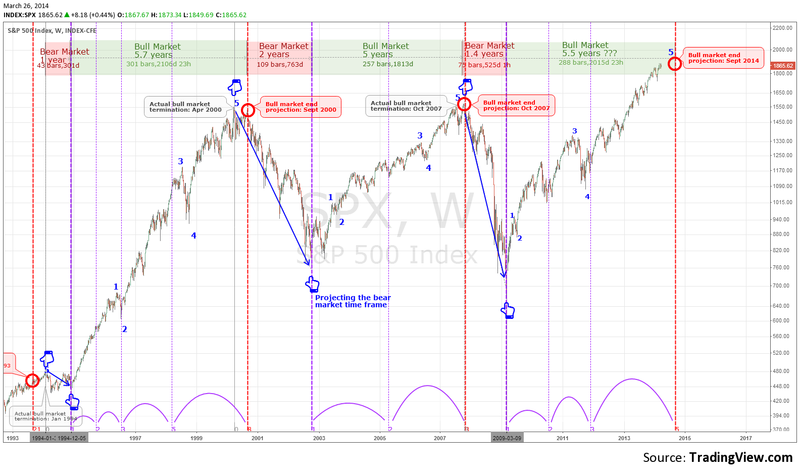 Fibbo time projection of that period after bull markets' fifth year appeared to be number 3 or the line coinciding with Oct 2007. The actual bear market started exactly on that date. Here the timing was with high accuracy. Currently we are in the fifth year of latest bull market and the logical question is when the current market will end its bull run? The 2007 bear market, which still reminds of itself, finished in March 2009. Its Fibbo projection after the bull markets' fifth year (2014) is the number five in the sequence which correspond to Sept 2014. Thus according to the Fibonacci time zones ratio the end of the current bull market is going to happen in Sept this year. Of course as back test experience shows there is possibility of several months deviation. Whether the market will undertake major turn nobody knows however the combination of maturing bull market, termination of the QE and other fundamental factors could prove the accuracy of the Fibbo time zone indicator again. Markets (S&P500) registered over 170% on the fifth year of its birth. Now the excitement is still on track as we are close to the all time highs but there are some facts to be considered before blindly jumping on the tide. Many analysts and advisers suggest cautious and selective investment in that phase of the market cycle. This sounds logical however the problem is that during drop or correction the correlation between assets is almost perfect. Thus led by the human fear of the masses one could hardly avoid the drop. Still it is better to know the big picture and decide for yourself what could you miss if you stay out of the market and what you could gain if you are in. 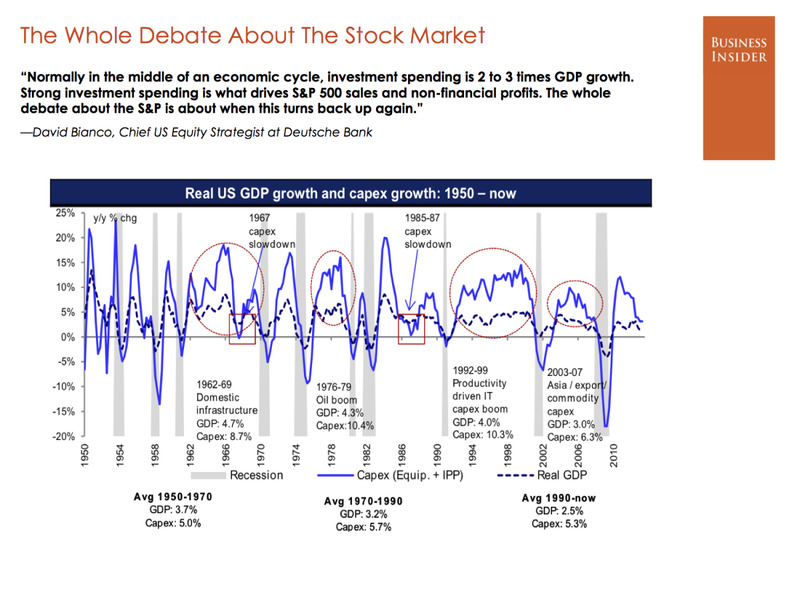 Here I am summarizing some of the recent research and data that support the cautious note on the state of the markets and the economy. Think about this for a moment. We are currently experiencing the 7th longest economic recovery in history with most analysts and economists giving no consideration for a recession in the near future." The chart below shows every post-recession economic recovery from 1879 to present. As it appears growth could continue even more than the current 60 months. The question is would you take the risk when the risk reward ratio is not in your favor? 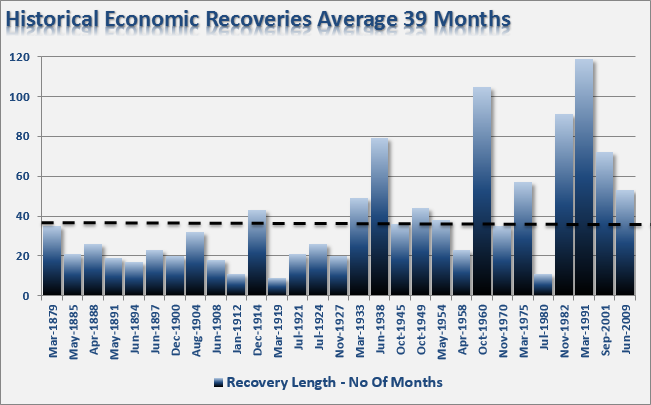 Would you bet on 24.14% odd that recovery will last more than 53 months? 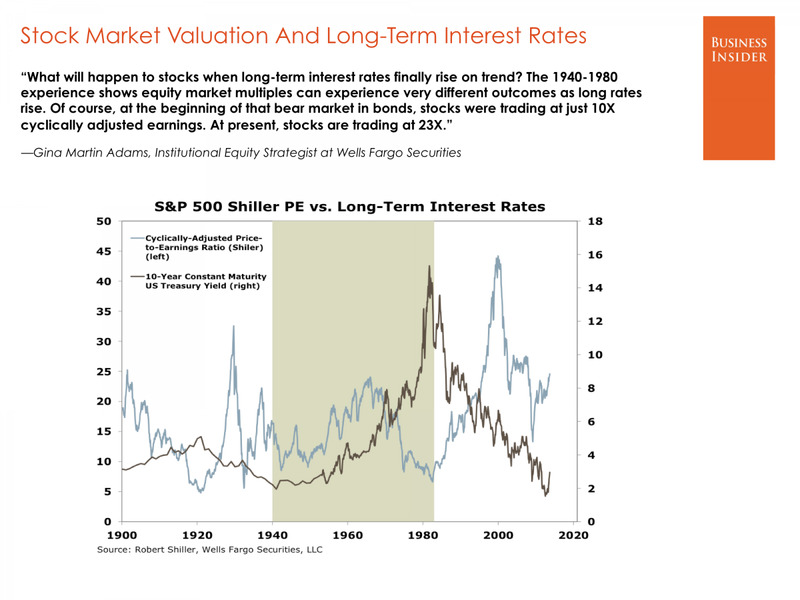 CAPE or cyclically adjusted price earnings ratio is one of the valuation benchmarks of the overall market. Readings above 20 are considered to reflect overvalued market. Most recent reading 25.72 is the third highest since 1881. Yes since 1881! It is lower only than the 2000 dot-com buble and 1929 peak preceding the black monday. According to this theory the market generally hits a low point every four years in the first, post-election, or the second, midterm year. The following two years are the best performers. Current 2014 year is a midterm year and keeping in mind that we did not witness significant correction in the exceptionally good 2013 there is a high probability of serious drop. 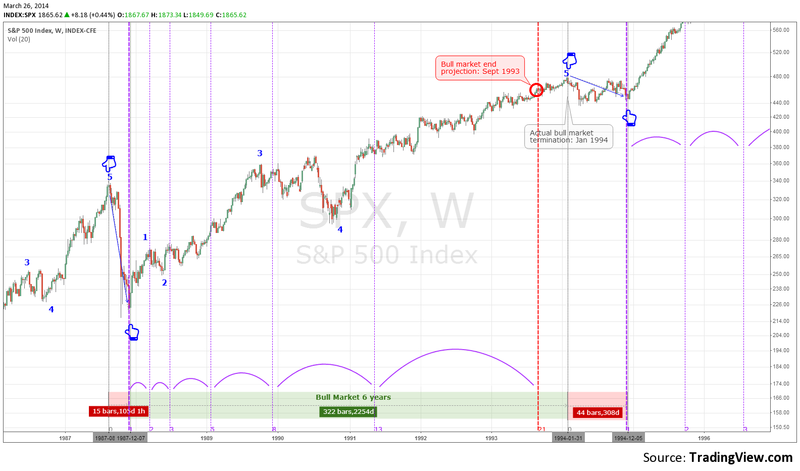 More detailed analysis you could find in my post "The connection between stock market and presidential cycle". The question what will happen when the long term interest rate finally rise greatly bothers the investment community? As suggested by the new FED chairman Janet Yellen the rise should be fact as early as April-May 2015. Here is the long term picture provided by Gina Martin Adams, Wells Fargo. The initial reaction would be sharp drop of the securities prices (lower CAPE, currently is at the elevated 25.72 level) followed by rally. 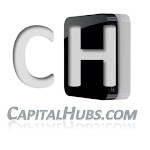 "Normally in the middle of an economic cycle, investment spending is 2 to 3 times GDP growth. Strong investment spending is what drives S&P500 sales and non-financial profits. The whole debate about the S&P is about when this turns back up again." Looking at a short term chart reveals the reversing core CAPEX. 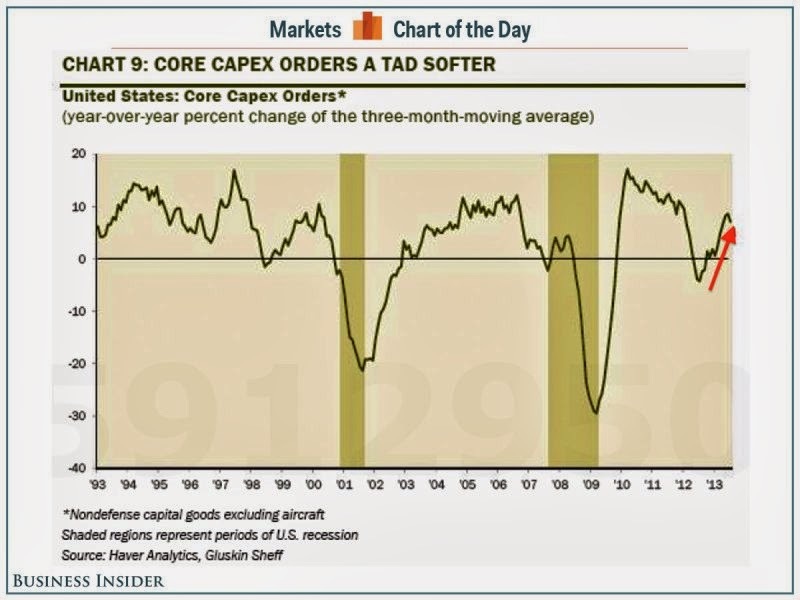 Paul McCulley, the former legendary economist and fund manager at PIMCO, uses the three-month moving average of core capex orders as his preferred indicator of how the broader economy is going to perform a few quarters into the future. This indicator is still positive but decelerating which is serious point suggesting growth under pressure. On the eve of its fifth year the bull market gained 170% over 60 months. 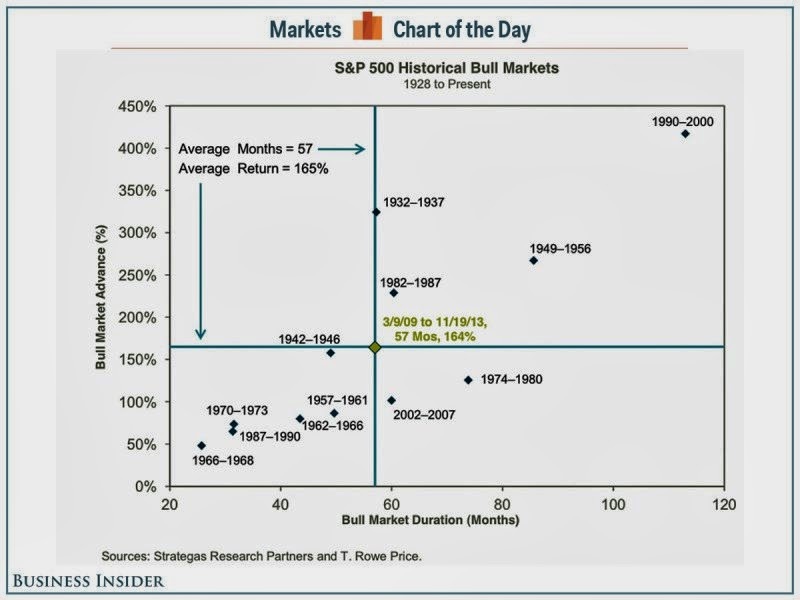 That is among the longest and strongest bull markets 1928 to present. Only three bull markets were longer (more than 60 months) and stronger (more than 170%) while only four were with gains above 230%. That is out of 13 bull markets since 1928 to date. Another factor confirming the elevated status of current markets is the NYSE margin debt level. 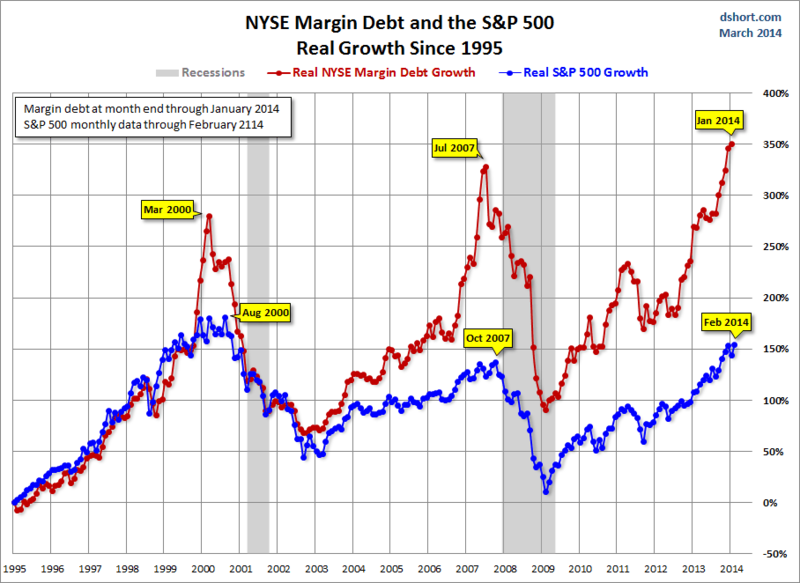 As seen on the chart recent all time highs are seen not only for S&P but for the margin debt as well. That indicates investors eager to pour money into the stock market. The most money are pumped the hither the stocks rise. However once the "fuel" keeping market machine working is reduced than the machine slows down. Previous two peaks in Mart 2000 and Jul 2007 were real predecessors of the market peaks seen few months later and followed by severe bear markets. The bottom line here: once we see a pull back in the margin debt we are in trouble. It is obvious that markets are at historical height, however they could stay in that state and even continue climbing for a long time before investors realize the real picture. Sometimes the real picture is invisible for the short term focused mass. Don't be fool enough not to see the forest because you stare only at the trees.